Ahead of the film’s trailer debut this weekend at San Diego Comic-Con, Warner Bros. is pleased to reveal the official teaser one-sheet for Aquaman. Anyone else seeing Shark Tale with those sharks in the background? Just me? 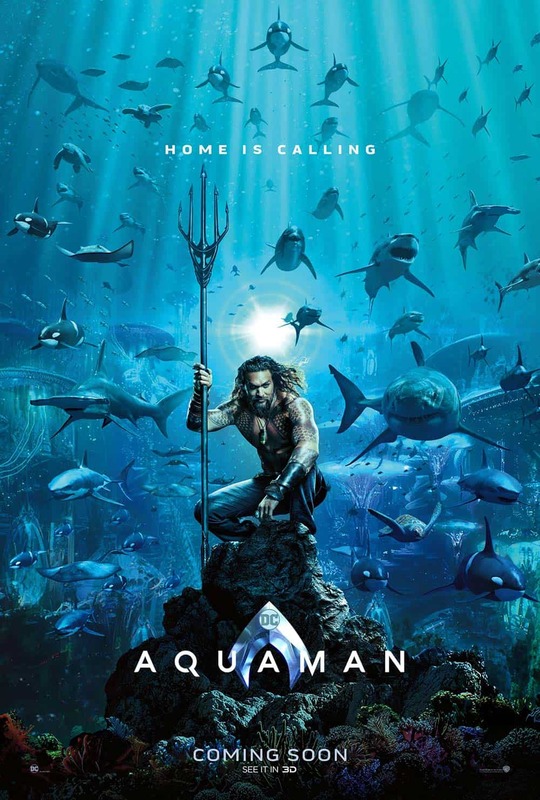 Directed by James Wan (The Conjuring, Furious 7) and starring Jason Momoa (Justice League, Sugar Mountain) in the title role, Aquaman also stars Amber Heard (Justice League, Magic Mike XXL) as Mera; Oscar nominee Willem Dafoe (The Great Wall, Murder On The Orient Express”) as Vulko; Temuera Morrison (Moana, Once Were Warriors) as Tom Curry; Dolph Lundgren (The Expendables films) as Nereus; Yahya Abdul-Mateen II (upcoming Baywatch, Netflix’s The Get Down) as Black Manta; with Patrick Wilson (The Commuter, The Founder) as Orm/Ocean Master; and Oscar winner Nicole Kidman (Paddington, Lion) as Atlanna.